1. Heat the oil in a medium frying pan to about 175˚C (or when a piece of bread sizzles gently when dropped in). Cut each block of feta in half or into thirds and dust each piece with flour to cover completely. Dip 2 pieces into the beaten egg, then fry in the hot oil until golden on both sides (about 1 minute per side). 2. Carefully remove the feta and drain on kitchen paper, then repeat with the remaining pieces. 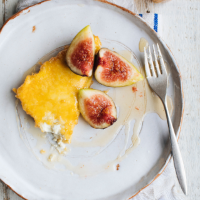 Serve immediately, with the honey and figs.